"We write to taste life twice, in the moment and in retrospect. Another year winds down and I'm now already preparing for 2018. Last year, I wrote a post on my search for a good notebook to capture all of my ideas, quotes, notes, etc. I ended up using Ink and Volt for the year, but supplemented it with another notebok. I'm now reviewing the words, ideas and things I wrote and I love that I was able to capture it all. In my June update on that post, I had mentioned that the Ink and Volt notebook I had was more of a planner so it didn't have a lot of extra space for me to take notes, doodle, etc. I love the fact that it had writing prompts, but I didn't feel it was enough for me. So the roundup for this year focuses more on blank notebooks/journals and less on planners. I've also like the A5 size as it is just easier to fit into my bags. I'm also looking for something thinner. The Ink and Volt as a full year planner had a hardbound cover. While beautiful, it was a beast to carry around. I still wanted to find something that was eco-friendly and easy to dispose of later. I'm also leaning more towards testing out the bullet journals so I'm keen of finding one with a dotted layout instead of a lined layout. Without further ado and in no particular order, here's the list of eco-friendly planners and notebooks for 2018. I have not selected my final notebook for 2018, but I will update once I decide. Comment below if you have used any of these or if I missed one, let me know. To get a list of notebooks, journals and planners from 2017, see this post. These I found on Amazon with the cover being made of cork which ultimately makes it easy to disassemble and recycle separately. I like that this has a pen holder, a page marker and an elastic closure strap. While I also am not one to rip pages from a notebook (I have plenty of scrap paper for that), I like that this has perforated scores so it's easier to pull a page if needed. Cover: 100% cruelty free cork material. These look cute and sleek. I've never bought anything from Muji before although I always stop by each time I am close to one of their stores to look around. These recycled notebooks come in adhesive bound or ring bound. One thing I'm not a fan of is the ring binding. I don't know, maybe because when I was in private school, they never allowed these kinds of notebooks because they would result in a mess, so I am just not too fond of them. I found these via a quick search. They are simple and sleek. These ReWrite notebooks are made of 100% recycled paper with 30% post consumer recycled paper. They are made in America. I like that they are blank and that you have options to select if you want it blank, lined or dotted. The covers comes in either black or brown where you have the option to customize yourself so that's nice. Guided appears to also be doing a lot in the sustainable, eco-friendly packaging department so it's nice to see a company doing that and creating new solutions to reduce packaging waste. 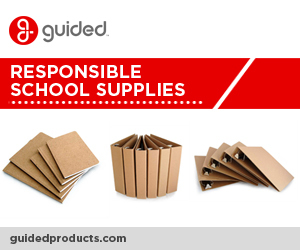 They have lots of responsibly made and source materials too for school or the office. I contemplated including this notebook in particular. There's no indication that the paper is made of recycled paper, but the cover is. One of the challenges I had when I was using my Moleskines for work was what to do with them after I used one up. I love that they had a durable cover, but they clearly weren't easy to recycle. These ones from Northbooks are made of sturdy paper so could be taken apart and recycled separately potentially. I found these ones while browsing around a Starbucks. 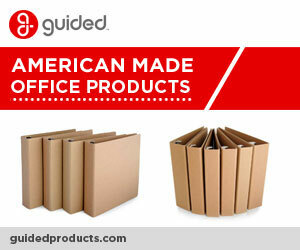 These are made of FSC Certified, green e-certified, acid free, 10% post consumer recycled paper. Further research finds that this company is certified BCorp and strives to donate 25% of profits of every sale to a teacher in a high need classroom who will fund a project that drives creativity. Want to track your goals? Grab these free journal inserts. Success! Now check your email to for the journal inserts. This notebook looks nice and sleek. It's made of medium-heavy 100% recycled paper. The seller indicates that they try to ship as eco-friendly as possible using recycled packaging material. I like the fact that it uses a medium-heavy paper which should be good to prevent bleed through. This journal looks slight different from all of the rest. It has that rugged look. It's completely handmade both the cover and paper. It uses Lokta paper, something I had never heard of until writing this. Lokta paper is made out of barks of a kind of evergreen tree. For a time, the paper was only use for government and religious texts in Nepal. The paper lasts long apparently as they have found text from 1200 years back. This notebook just looks cool as if you've made it yourself and bound it together. Binding: No paper binding, but the whole thing can be tied with leather or tie. This is another journal made out of Lokta paper. The Lokta bark is sustainable harvested so that it can grow back in 5-7 years. These notebooks are made by rural women in Nepal. The binding on these look secure and with the handmade nature, each one will be unique. For my 2017 notebooks, I usually keep them for a few years after they are filled up. I rarely reference them, but like that they are there for me to review. It will be a few years before I will recycle and for some of the notebooks, I will just remove the pages and recycle the paper and figure out what to do with the covers later on. I ended up ordering a 3 pack of the Guided Recycled Notebooks. They just came in the mail and look great. A bit thin, but I think I'm going to be OK with that since it will be easy for me to compartmentalize notes and such and only bring a small notebook at a time. I also created these templates to insert into them. Check it out here and sign-up to get the FREE printable templates emailed to you. Here's how I'm currently using the notebooks and printables.